Back to school is right around the corner. Are you labeled? Home > Blog > Back to school is right around the corner. Are you labeled? As we approach the middle of August, we find that the Back-to-School shopping season is already upon us. And being prepared to move into the next grade is extremely important business. A lack of readiness or absolute preparedness greatly affects the mood you set for your school year. Which kind of mood you set is up to you. Using name labels for school is one way to be prepared. Check out Iron On Clothing Name Labels from Everything Summer Camp as well as our Stick On Name Labels to take care of labeling your school clothes and school supplies. It’s a very wise idea to have your clothing labeled at school when you’re changing into your gym clothes for Phy. Ed. class. And, of course, you’ll want your name on your jacket and snow pants when you bring them to school. Make sure your other school items like notebooks, folders, pencil cases, etc. are labeled with your name. Take care of this with our Stick-On Name Labels. 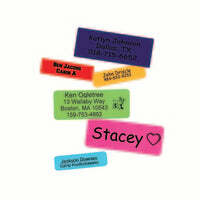 With these labels you can tag just about any flat-surface you can find on your school supplies. You can also label your more personal items that you take along to school such as a glasses case or water bottle. 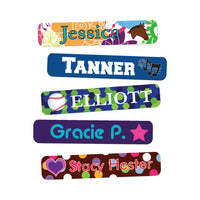 Iron On Clothing Name Labels and Stick On Name Labels from Everything Summer Camp are available in a plethora of vibrant colors and four, cool backgrounds. Go with your favorite color, the Dots background, Camo, Hex, or Botanical Explosion! These labels are sure to look great on all your school items. Check us out for other labeling methods too, like our customizable, multi-purpose Clothing Stamp. Or go the manual way with a set of laundry markers! Put it all to good use and arrive at school labeled!